Just started (!!!) my entry for Adam Clarke's Black Scorpion Miniatures painting competition. The final date for submitting entries is May 16th, so I am planning to do 3-4 hours of work today, the same tomorrow, and then do the base and photography on Friday! Tight deadline - oh yeah! The other model is a late 80s chaos dwarf from Citadel Miniatures - he is mainly a practice model for a colour scheme and a test model to work on my blending. 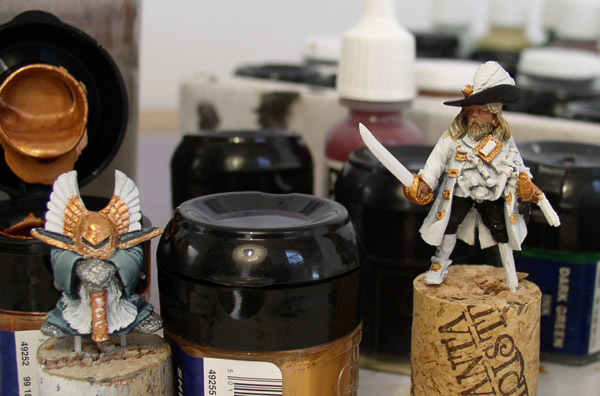 EDIT: Didn't make the dealine after all, but I will see if I can get my pirate captain finished over the summer. In regards to the competition Martin Footitt won (again) with a splendid cabin boy on a superb scenic base. Congratulation Martin!